Circuit training is interval strength training with exercises selected to improve power and endurance, and as the name implies, the Circuit Trainer is used to assist you during your circuit workouts. Regulate your exercise and rest ratios by programming your time periods into the unit. Amplified horn blasts designate when to switch and the LED digital display shows current progress. Achieve overall body fitness anywhere with the new Circuit Trainer. Set both Rest and Exercise time periods ranging from 1 second to 20 minutes. Repeat pre-set circuit cycles up to 99 times or repeat cycles infinitely. Review time, cycle count, and mode status clearly with large digital display. Adjust the volume so that the horn blasts can be heard across the room or open space. Alerts when Exercise time period is half complete. Great for lateral exercises that work both sides of the body. Runs off of 2 batteries for up to 240 continuous hours. Makes it easy for travel and eliminates the need for wires and plugs. Use outdoors, on the pool deck, or in the rain. 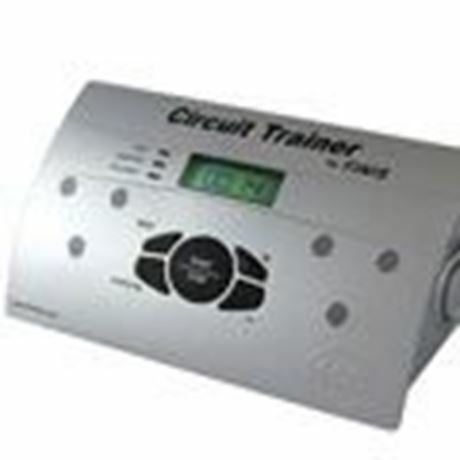 Take the Circuit Trainer anywhere!